The Unetbootin’s menu, apart from Live Fedora 16 LXDE run, offers some other options, like run in basic graphic mode, direct installation or media verification. Of course, I selected the Live run. Fedora 16 LXDE boot time was pretty short. There were no additional questions on the screen during the boot. Freshly booted system took exactly 200 Mb of memory. Honestly, I expected less from LXDE-based distribution. Once booted, the desktop loaded with the same wallpaper as in any other spin of Fedora 16: underwater world of Captain Nemo. Other wallpaper options include half a dozen nice images of different types: space, flowers, ladybugs and so on. My personal choice, (suiting my mood at that time), was a photo of flowers. There was only one icon on the default desktop: Fedora installer. The panel was in its usual place at the bottom of the screen. Items on the panel are more or less standard for most distributions with “classic” layout. The button with Fedora icon is in the bottom-left corner of the screen. It launches the system menu. This button, like most, but not all other elements on the panel, changes its colour slightly when you move the mouse cursor over it. It starts shining. Next to the menu button you can find several quick launch buttons for file manager PCManFM, LXTerminal, Show Desktop (iconify). A switch between two virtual desktops sits next to them. The taskbar is in the middle of the panel in Fedora 16 LXDE. Each virtual desktop, by default, has its own set of taskbar items. Also, and it was a surprise to me, each dialog window in the programs creates a new taskbar item. The right part of the panel, the notification area, has more or less standard tools: volume control, network monitor, clocks, clipboard manager, screen locker and Logout button. Clocks are set up to -5 hours from hardware clock time, which in my case moved me from London (where I live) to New York (US East Coast time). From the unusual items on the right side of the panel, I’d like to note the CPU Usage Monitor. Fedora 16 LXDE automatically recognised and configured my Wireless Network card Intel 3945 ABG. I saw the list of available networks when I left-clicked the Network Monitor icon in the system tray. A few keystrokes to set up the passkey for my home network, a few seconds to wait for a connection, and I was online. Firefox 7.0.1 is the default and the only browser in Fedora 16 LXDE. Other than Firefox, you can find Pidgin, Transmission and Sylpheed e-mail client in the Internet section of the menu. Productivity tools in the Fedora 16 are represented by GNOME Office applications: AbiWord and Gnumeric. I drafted this post using AbiWord 2.8.6. It worked well for me. Personal organizer Osmo completes the Office section of the menu in Fedora 16. There is no presentation tool in this distribution, because there is no such tool in GNOME office. GnomeBaker is a disk burning utility in Fedora 16 LXDE. I tried to use it for copying a CD for the order I got at buylinuxcds.co.uk, but GnomeBaker crashed. Was it a problem of the Live run, or GnomeBaker in general? Honestly, I like GnomeBaker itself. I miss it because it is no longer in Debian or Ubuntu repositories. If anyone knows how to install GnomeBaker in Ubuntu or Debian, please share in comments. Other than GnomeBaker, the Audio&Video section of the menu includes GXine Video Player, LXMusic Music Player, Asunder CD ripper and Pulse Audio controls. The graphics tools in Fedora 16 LXDE include ePDF viewer, Image Viewer and mtPaint. As you can see, the list of applications here is rather limited. For example, there is no GIMP or any screenshot utility. Maybe the screenshot tool is in Accessories, like in some other Linux distributions? Unfortunately, there is no screenshot utility in Accessories section, either. But Accessories include on-screen keyboard, Indic on-screen keyboard, xPad, Leafpad, calculator, archiver and the file manager. More or less a standard set of utilities, I would say, apart from two on-screen keyboards. I wonder why the Indic one was included in the default worldwide distribution. 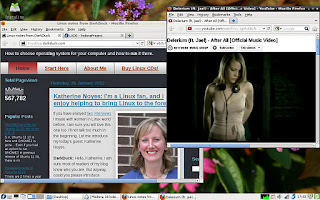 Is Fedora 16 LXDE mainly targeted to people in India? I doubt it. System tools include familiar tools, too. LXTerminal, Disk manager, Task manager, Fedora installer and Yum Extender are the most necessary tools here. Gigolo (remote partition mounting tool) is also listed. As you can see, Fedora 16 LXDE uses some LXDE-native applications, which are given by their LX-names. Yum Extender is the package management tool in Fedora 16 LXDE. It downloaded a list of repository items during the first boot - which alone was about 20 Mb! Then it found about 290 updates for my system. Of course, I did not want to install them in my Live USB run. Yum Extender itself is not the most visually attractive tool, but it is enough for search and installation of packages in the repository. Because Fedora 16 LXDE does not have any screenshot utility, and I wanted to make some, it was a good reason to see Yum Extender in action. A search for “screenshot" in YumExtender gave me Shutter as an option. The package size for it was only 1.4 Mb, but it required an additional 33 Mb of dependencies, mostly Perl and GTK components. When the installation was complete, Shutter appeared in the Accessories. Some kind of Flash is included in the Fedora 16 LXDE default distribution. I can tell this, because I was able to watch YouTube videos in Firefox immediately. But I could not view flash videos on some other pages, where I was advised to install the x-shockwave-flash plugin. The installation of Flash plugin was not an obvious task, mostly because there’s no associated program to work with .rpm files in graphical mode in this distribution. I ended up downloading an rpm file from the Adobe site and then manually installing it via the command rpm -i flash-plugin-11.1.102.55-release.i386.rpm. More complexity was added because liveuser (the user for Live session of Fedora 16 LXDE) is not in sudoers file. As a result, I needed to switch to su mode first. Anyway, Flash plugin was installed. Firefox was restarted, and I was able to see the sites which require this plugin. I was not able to configure several layouts for the keyboard. There are items like Language and Keyboard in the Administration part of Fedora 16 LXDE menu, but they allow switching the system language and keyboard layout for the system in general. There is no graphical configuration tool for multiple keyboard layouts. Documentation confirms this: it is only available via manual change of X-server configuration file. In addition to issues with keyboard layouts, the touchpad was not fully functional in Fedora 16 LXDE. Scrolling and clicking (tapping) on the touchpad were not working, and I found no place to configure them. I tried to use Gigolo to connect to my external network drive. But, unfortunately, Gigolo did not list CIFS or Samba as a protocol option. FTP, WebDAV and SSH were the only ones available. That’s why I could not use Gigolo this time, although mounting of a network drive using the mount -t cifs... command worked fine. It means that Samba client (smbfs) exists in Fedora 16 LXDE. But any attempt to browse the newly mounted directory using PCManFM or even from the command line (command ls) led me to a kernel panic. As a result, I had to use the Power button to switch my laptop off and then back on. What is the general impression? Fedora 16 LXDE left quite an ambiguous impression on me. From the performance side, everything is perfect. The system is responsive, quick and stable. Except for the case when I got a kernel panic in Samba mounts, I experienced no instability whatsoever. But on the other hand, the LXDE spin of Fedora 16 out of the box is far less functional than its brothers. To start with, I need, desperately need, an option to configure keyboard layouts. I perfectly understand that text configuration files are available. But we’re in the 21st century now. Why should I bother with text files? The distribution image size is rather small. But at what cost? No GIMP? Not even a screenshot tool? Guys, I’d be happy to see the image size a couple of megabytes larger, which saves me from having to install a screenshot utility. Maybe your choice would be even better than Shutter, which I tried. Because, I believe, Shutter is not the LXDE-favourite screenshot application. Anyway… Even if I am not a big fan of Fedora 16 LXDE now, you may have a different opinion than me. If you want to try this distribution yourself, why not order a CD with it using the Buy Linux CD service from our sister site? 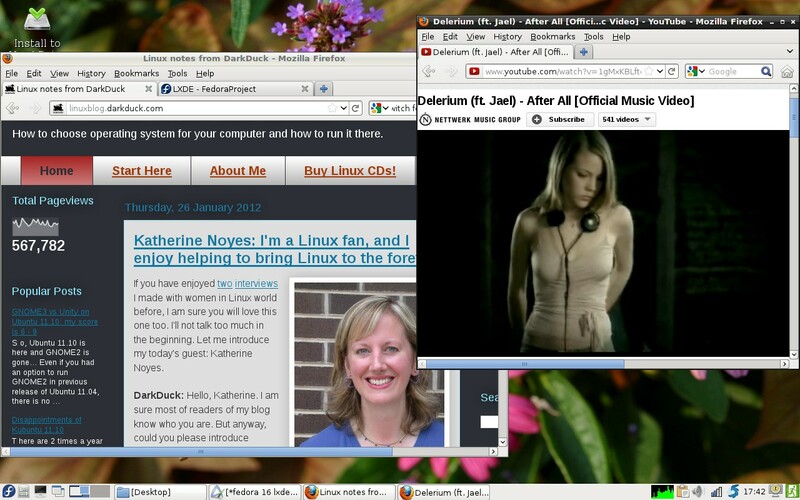 I'm in the process of auditioning Fedora 16 DMs to move to from Gnome 2. So far, LXDE is looking good, at least for a traditional desktop computer. I suggest that users - whose preference is to start with a basic system and then add applications of their choice - give it a try. There probably are better choices for anyone looking for a light-weight distro; F16 LXDE has a good bit of Gnome "under the hood". Well could be; I've only tried the Fedora version. Btw, realized after posting that - given your location - I should have used "bonnet" rather than "hood". I've been having issues with my Ubuntu 11.10 install (mainly down to not liking Unity), and yesterday I couldn't use anything any application without it stopping on load. Wondering if I should fall back to a 32bit spin? How did you create Live USB? Unetbootin option worked for me. If you don't like Unity, try GNOME 3 on Ubuntu or go to Xubuntu. Hi Darkduck - yes, tried a 64 bit and 32bit spin, including LXDE and KDE. Unetbootin didn't have an option for Fedora 16, so I just used the USB / ISO combination. Always locked up 30 seconds after boot. I use F16 Lxde as my everyday system these days, it has worked well for me. It runs quite smoothly, I would say - I use an older Thinkpad X32 with 1G RAM, 16MB graphics card and a 1.4GHz processor. http://syntaktisk.dk/grphcs/desktop191211.png is what I see when I boot up. As for screenshots, it does have imagemagick by default, so you can call 'import -window root desktop.png', and you can change keyboards with 'setxkbmap ru' like I do for the Danish 'setxkbmap dk'. The fact that you were seeing Youtube videos suggests to me that it rolls back (if you can call that back) to HTML5 on playback. I did not know that Fedora includes imagemagick. Thanks for letting me know. But anyway, graphical environment is better with graphical tools, isn't it? There are 2 more issues with direct usage of setxkbmap: 1) it does not activate keyboard layout indicator in the status bar, and 2) once setxkbmap ru is entered, you can't type setxkbmap en, because there are no Latin characters! I completely agree. I also wondered about the keyboard settings tool. When I use 'setxkbmap ru' - not that I do it often, but, иногда нужно - I write 'setxkbmap dk' on the terminal line above it to have it in history. Just a habit from the old days, I guess. It should be mentioned that you set your default keyboard when you run the Fedora installer - so it is just an issue with the live system. In my case, using the import command for screenshots is simply because I do it so rarely that I did not feel a need to install an application for it. I need a screenshot tool to make screenshot for my review. That's why I am looking for one in almost all my reviews. You have a funny trick about the setxkbmap. I disagree about "just an issue with the live system". It is not, because I need to type both languages in every system. Of course, I can set up the keyboard configuration for X-server, but that's a 20th century, isn't it? We live in 21st. Очень приятно, что Вы тоже иногда пишете по-русски.